The leaders of the Asia-Pacific Economic Cooperation forum. President Vladimir Putin’s meetings with leaders in Peru, on the sidelines of the APEC summit, focused on the likely impact of the Donald Trump presidency on the region and how his presidency in the United States will re-shape global geopolitics. Russian President Vladimir Putin's trip to the APEC summit in Peru was clear indication that the Pacific is becoming increasingly important for Russia, and the ‘pivot to the East’ is important for countries of the region. Putin had his last meeting with outgoing US president Barack Obama, a pure formality against the backdrop of "the wait for Trump". The Asia-Pacific Economic Cooperation (APEC) summit was held in South America this time, even though, as a rule, it is usually held on the other side of the Pacific Ocean. There are only a few Latin American countries in APEC. 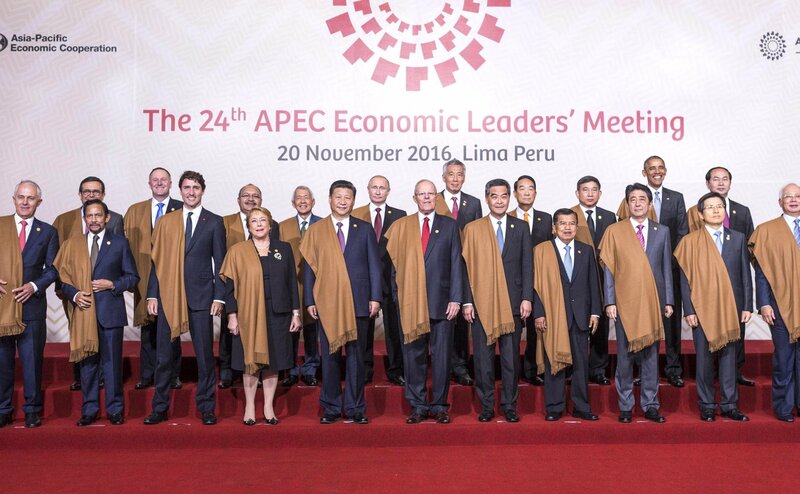 Apart from the current host country Peru, Mexico and Chile are members of APEC. For Putin, this visit to Latin America was not the first, but he has not visited Peru earlier. Even during the Soviet years, Peru was one of the few Latin American countries that expressed sympathy for Moscow and even bought its weapons: an anti-imperialist and left wing military junta was in power in Lima for decades. The civil Marxists came to power in Peru when the Soviet Union was already in decline, but relations between the two countries never took off because of the collapse of the Soviet Union. Peruvians have always bought Russian weapons and, in recent years, seeing Russia’s presence intensifying on the world stage, they have been keen to expand cooperation. Putin has established regular contact with President Ollanta Humala of Peru (the first Inca to became head of State), who held the post until recently. The authorities in Peru have changed this year. 78-year-old Pedro Pablo Kuczynski, who welcomed Putin and hosted the APEC summit, is a veteran of Peruvian politics (and cousin of French director Jean-Luc Godard). For Russia, Peru is an important partner in South America, among the top five countries in the continent of special interest to Moscow - along with Brazil, Argentina, Venezuela and Chile. However, during the summit, Russia’s relations with Peru did not get any real coverage in the Russian media; both because of a poor understanding of Latin American specifics and, more importantly, because of the breakdown of the aircraft with Russian journalists on board in Lisbon. They ended up missing half the summit in Lima. Before Philippine President Rodrigo Duterte met Putin, he called him his idol, and after their conversation, which he described as "very productive", he confirmed the intention of the Philippines to join the "Russian-Chinese world order," the new world order he announced, in which Putin and (Chinese President) Xi prefer to work in silence, saying that "Russia, China and the Philippines will make everything perfect!" Putin met the Philippine President on the first day of the summit - and Duterte, who has become famous in a few months for his sharp attacks on the US and on Obama personally, began to criticize the Americans this time too. This was not an attitude; since the Philippines felt it was an American semi-colony, the desire to find real national sovereignty led to such extremities. Duterte will visit soon Moscow, where he will seek the support of an independent course for Philippines, away from the United States. As he said recently in Beijing, he will play on tensions between China and the Philippines as an essential element of the American policy of containment of China. Duterte, however, wants to talk with (US President-elect Donald) Trump. Considering that the question of what policy Trump will choose in relation to China is now central to world politics, the Philippines, in any case guarantees close attention coming from major world powers. At the APEC summit in Peru, the outgoing US president said goodbye to his colleagues - he had a separate meeting with Xi Jinping and spoke to Putin on the sidelines of the summit. If Obama had essentially nothing to say to the Chinese and Russian leaders, he tried to convince the other participants of the summit that the Transatlantic Economic Partnership is not buried. Obama considered the signing of this agreement one of his main achievements, - and it just concerned most APEC member countries, except, of course, China and Russia. It was, in fact, directed against Beijing. The idea of a common market in the Pacific region has been rejected by Trump - and the agreement has no chance of being ratified by the US Congress. Signatory countries of the region are already responding to the coming change in US policy – for which, the main thing in principle is finding the best way to survive and gain a foothold in the new round of the US-China confrontation, set to start soon. Meanwhile, Russia continues to strengthen its positions in the Pacific region, with member countries and APEC's major powers. The new "normal" is not only the meeting with Duterte, but also to Putin’s meeting with the new Vietnamese President Tran Dai Quang (although, in Hanoi, the leader of the Communist Party is the Chief). Vietnam is historically an important ally of Russia, and next year, Putin will time his official visit to Hanoi to the next APEC summit. Putin also met with the leaders of China and Japan in Peru. He discussed his forthcoming visit to Japan with (Japanese Prime Minister Shinzo) Abe. It is understood that the Russian-Japanese summit and the new American president’s plans were also discussed during the meeting with President Xi. The Asia-Pacific region includes the US, China, Russia and Japan, and the next metamorphoses in the atmosphere of international relations depend on how Trump is going to behave in this region as a whole and with each of the players individually.